Unusually good winter weather in January and February led to lower job growth in March. The Labor Department reported that the economy added just 120,000 jobs in March, a sharp slowdown from the pace of the prior three months where growth averaged 246,000. The slowdown was pretty much across all sectors, with manufacturing, which added 37,000 jobs in March, being the major exception. In spite of the weak job growth, the unemployment rate edged down from 8.3 percent to 8.2 percent. The drop in unemployment over the last two years has been striking given the limited growth over this period. While the unemployment rate has fallen by 1.8 percentage points since its peak in October of 2009, the employment-to-population ratio (EPOP) is up by just 0.3 percentage points from the low it hit in December of 2009. Clearly, most of this decline is the result of people leaving the labor force rather than unemployed workers getting jobs. Nonetheless, there was good news in the March household survey. The EPOP for African Americans rose for the fourth consecutive month to 53.2 percent, 2.3 percentage points above the low hit last summer. The EPOP for African-American women rose to 55.4 percent, 2.5 percentage points above the low hit last summer. The percentage of unemployment attributable to people voluntarily quitting their jobs rose by 0.8 percentage points to 8.7 percent, the highest share since December of 2008. All the measures of unemployment duration improved in March, and the number of people involuntarily working part-time fell by 404,000 to the lowest level since November of 2008. This helped push the U-6 measure of labor market slack to 14.5 percent, the lowest level since January of 2009. The slower job growth shown in the establishment survey in March likely reflected the fact that good weather pulled forward a lot of hiring so that workers who might typically have been hired in March instead found jobs in January and February. This is most obviously the case in construction, which showed a loss of 7,000 jobs after showing an average gain of 13,000 in the prior three months. Weather may also explain the decline of 14,200 jobs in employment services (the broader temp category) after the sector added an average of 45,600 jobs the prior three months. The auto sector continues to be a driving force in manufacturing, adding 11,600 jobs in March. However non-durable manufacturing also showed some growth, adding 11,000 jobs in March -- the third consecutive increase in sector after losing jobs through the fall. Retail lost 33,800 jobs in March. This likely reflects some timing issues but probably also some decline in business at weaker retailers such as Sears and K-Mart. The monthly chain store data released yesterday presented an overly optimistic picture since they exclude these chains as well as Wal-Mart, which together comprise close to half of the sector. Health care added 26,000 jobs in March, down from an average of 38,000 the prior two months. The earlier rate was too high to be plausible, so there was likely some weather effect here as well. Restaurants added 36,900 jobs, keeping up a rapid pace of job growth since the fall. This will almost certainly be lower in the spring. One very positive item is that government employment rose slightly in March. It has been virtually flat since December, indicating that the sector may no longer be a drag on growth going forward. One very discouraging item in the survey was a 0.1 hour drop in the length of the average workweek. While the data are erratic, the drop was driven largely by a decline of 0.3 hours in nondurable manufacturing, a sector where hours tend to be better measured. 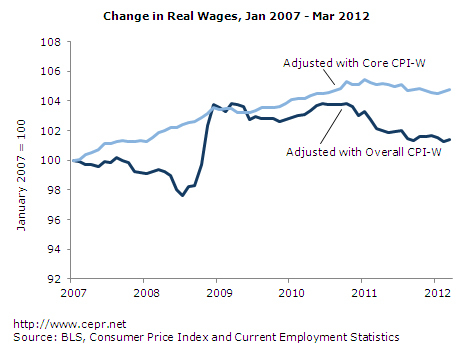 Wages continue to go nowhere. The average hourly wage has increased at just a 1.85 percent annual rate over the last quarter, which likely puts it behind inflation. The wage for production, non-supervisory workers, which better tracks the median wage, increased at just a 1.37 percent annual rate over this period. The weaker job growth in the March data is primarily an artifact of the weather. However the 212,000 average job gain over the last three months is not especially strong. It implies a return to full employment some time in 2019.